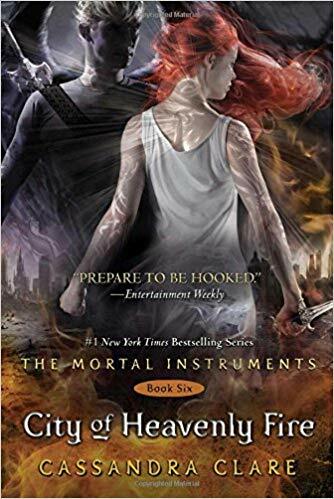 Mortal Instruments: In the seventh grade, I wanted to read this series, but my librarian said that I was too young for it. In the eighth grade, I started reading it (I do not know what one year of time can do to a kid which makes them suitable to do tasks which they were not allowed to do before). This series is written by Cassandra Clare. The whole series talks about a different world from the human one, where werewolves, vampires, wizards, etc. all exist, but are much different from what you imagine. They are commonly referred to as Downworlders. Topping them all are Shadowhunters, a race of warriors who have sworn to protect the humans and the Downworlders from demons. The main protagonist is a sixteen-year-old girl named Clary Fray, who is told she is a a Shadowhunter in the first book. The series has two main antagonists, one is Valentine and the other is Sebastian, both who I am not going to tell you about because they are spoilers. All I can tell you is that they are two power-hungry maniacs, one who wants to wipe out all the Downworlders and the other who wants to wipe out all shadowhunters. Clary along with her friends have to stop these two villains before they wipe out an entire species. It was the first series which I have read, where there was some serious romance between the characters (I skipped those bits. Too soppy for my tastes). This made it different, because before reading a page, I had to skim over it, fearfully, hoping there weren’t any nasty surprises.